Homemade pastry, stuffed with mixture of lightly spiced potato and peas. Sliced onion, stirred in chickpea flour and deep fried. Succlenr chicken, marinated in our famous tandoori marinade then cooked to perfection in tandoor. Boneless chicken marinated in cashew nut, cheese, egg and yogurt. Succulent marinated kean minced lamb, smoked in tandoor oven. Spring chicken marinated in authentic spices and yogurt cooked to perfection in traditional tandoor, the secret lies in the marinating process. Fish fillets in authentic spices cooked to perfection in the traditional chef's style. Vegetable samosa, chicken tikka, lamb seekh kebab and onion pakoras. Combination of seekh kebabs, malai kebab, chicken tikka and tandoori chicken. Marinated chef's style cottage cheese served with onion and capsicum. Our most popular curry, tender morsels of boneless chicken/beef cooked in the tandoor finished in a mild creamy tomato based gravy. Our classic curry cooked with onion, tomatoes, ginger in chef' special masala. A mild delicious creamy curry cooked in seeds and grounded cashew gravy. Tender morsels of boneless chicken/beef, smoked over charcole, finished in a rich tomato and onion sauce. The delicious dish comes traditionally from Sounth India. Prepared with coconut and a hint of red chilli, curry leaves and mustard seeds. Chicken/beef cooked in delicious mango flavour creamy and lightly spiced sauce. Boneless chicken/beef cooked with capsicum, onion, tomato and herbs in a traditional kadhai. Succulent pieces of chicken/beef cooked to perfection with spinach and spices. A classic - sauteed in onion, tomato and fine selection of Indian herbs and spices - slow cooked to perfection. Marinated chicken/beef cooked with seasonal vegetables and light spices with tomato sauce. Tender morsels of boneless lamb cooked in the tandoor finished in a mild creamy tomato based gravy. A mild delicious creamy curry cooked in almond and grounded cashew gravy. Succulent pieces of lamb cooked to perfection with spinach and spices. Marinated lamb cooked with seasonal vegetables and light spices. Boneless slices of lamb cooked in fine hot and tangy vinegar sauce. A classic from Mughal era - boneless lamb curry cooked with special spices. Lamb cooked in thick onion gravy finished with capsicum and onion. All curries comes with rice. Prawn cutlets sauteed with onion, capsicum, coriander and fresh coconut cream. Tender cooked scallops in butter masala sauce. Chunky pieces of fish simmered with spices, herbs, tamarind and coconut. Fish cooked in thick onion gravy finished with capsicum and onion. Prawn cooked in thick onion gravy finished with capsicum and onion. Tender prawn cooked in the tandoor finished in a mild creamy tomato based gravy. Fresh cottage cheese cooked in a butter, tomato sauce. Homemade cottage cheese cooked with a subtly spiced spinach gravy. Cauliflower and potatoes cooked in exotic spices with tomato and ginger. Fresh seasonal vegetables cooked in creamy cashew nut mild gravy. Vegetables cooked with light spices and tomato sauce. Green lantils stewed on slow fire over night. 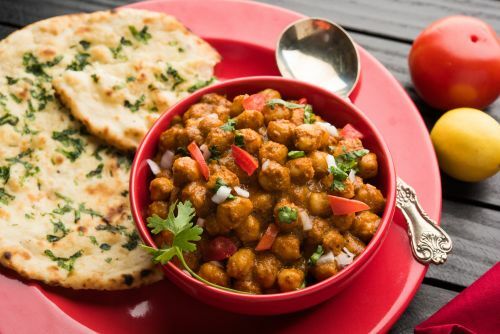 Chickpea cooked in lightly spiced tomato and onion gravy. Potato and peas cooked in subtle gravy. Homemade cottage cheese cooked with a medium spiced masala sauce. Green dhal tempered with cumin seed and garlic. Mashed potato and cottage cheese ball, tossed in a delicious gravy. Potato cooked in a traditional spinach gravy. Seasonal vegetables cooked with rice in herbs and spices. Pan-fried rice with vegetables/chicken with spices. Seasonal vegetables slow cooked with herbs, spices and basmati rice. Chicken and rice slow cooked on dum with authentic spices yogurt and herbs. Tender lamb pieces slow cooked with herbs, spices and basmati rice.